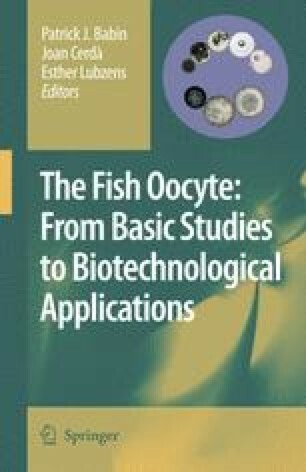 As in other lower vertebrates, teleost oocytes growing within the ovary pass through a series of developmental stages that eventually culminate in the production of a mature female gamete or egg. During most of its time they are temporarily arrested in meiotic prophase I, and energy expenditures are concentrated on the synthesis and uptake of various substances (e.g. vitellogenin (Vg) ) required by the developing oocyte and subsequent embryo development. After oocyte growth, meosis resumes as the large nucleus or germinal vesicle breaks down (GVBD), half the chromosomes are eliminated into a small polar body by unequal cytokinesis, and the remainder becomes aligned in second meiotic metaphase at the animal pole. During this process, termed “meiotic maturation”, or “oocyte maturation”, ovulation generally occurs. Shortly after second meiotic metaphase is achieved, the oocyte becomes “activable” or capable of being fertilized, and hence becomes an egg. Yool, A.J., Brokl, O.H., Pannabecker, T.L., Dantzler, W.H., Stamer, W.D. Tetraethylamonium block of water flux in aquaporin-1 channels expressed in kidney thin limbs of Henle’s loop and a kidney-derived cell line. BMC Physiology. www.biomedcentral.com/1472–6793/2/4 (2002).